Attic storage space. It’s limited. And, one thing we all seem to do is to collect more and more possession (read: junk). We stuff it in closets, under beds, behind things, in storage areas, and, in the attic. 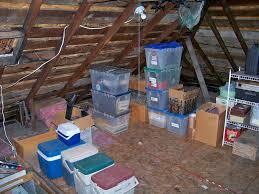 Eventually, there’s not enough space and if your attic is ready to burst at the seams, you are certainly not alone. That’s when it’s time for a total attic cleanout.Depending on your home’s size and style, your attic can be a small space that’s cramped with air ducts, or, it could be large enough to accommodate a bedroom. In addition to these, it can be a place where you can store stuff in an organized manner, but, you’ve got to get it in order first. For many homeowners, their attics are a place that’s visited a couple to a few times a year. For others, it could be a space they enter far more often because of what’s being stored inside it. For still others, it could serve as an office space, a playroom, or an entertainment space. Clear out the attic and start with a blank slate. A good place to start with any project is at the beginning. That’s not meant to be insulting or even chuckle inducing, but it’s very true. So, start by clearing out what’s in your attic and sorting it out to get better organized. Reroute the air conditioner ducts. If it’s possible, you ought to reroute the air conditioner ducts. You might opt to replace them and install new insulation to improve energy efficiency while also getting a bit more space to store items. Install vertical storage shelving. When we think about storage, we generally think about size in terms of depth and width. However, there’s another component, which is height, meaning that you ought to think vertically, if your attic has the room. Shelving is a great way to store stuff and in an organized way. Group like and related items into boxes. As you are putting things in your attic, be sure to group like items and always leave a path to navigate for easier retrieval when you need things. You’ll probably wind-up with quite a bit of stuff left over that you no longer use and/or want. You can give this away to charity, or, if it’s not in good condition, just phone a junk hauling and removal service to pick it up and take it away.If you need an attic cleanout done and done right, just phone 800-433-1094 or visit Junk Garbage Removal.